To publish an ebook on the Nook you will need to create an account with Nook Press. Once you create your account the new project process will start. 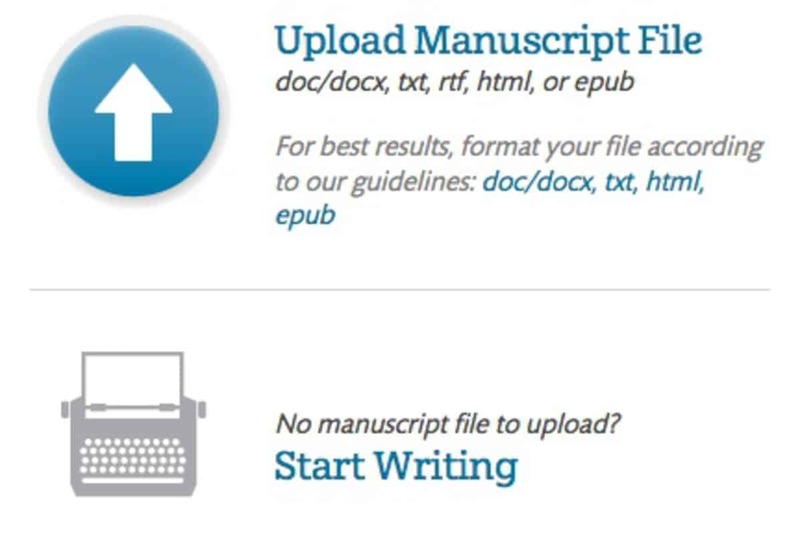 Just click on the "Upload Manuscript" file and you can pick the file you want to upload. We suggest you create an epub file instead of having them convert your word file. Creating your own normally results in a much higher quality ebook and gives you much more control over the process. The next step is to upload the cover you created. The information in this section determines what your book will look like on the Nook site and where it will appear. Click on any of the fields under a specific category to open the edit window for that section. You can hop around and enter the information in any order that works for you. Enter the title of your book you came up with earlier. Also include the sub title if you want it to show up on the Nook sales page. This allows you to set a publication date for when your book will go live. You can publish right away or choose to delay the launch of your book. This can help to easily time the release with any launches you may have planned. Enter in the publisher of your book, or your blog as the publisher. You can add any contributors that were an integral part of the book creation process. Any people you add will show up on your Nook page right next to your name so make sure you only add people here if you want them to have equal credit with you. Take the cookbook description you created earlier and enter it here. For the Nook you have very limited formatting you can add so it is best to use plain text here. 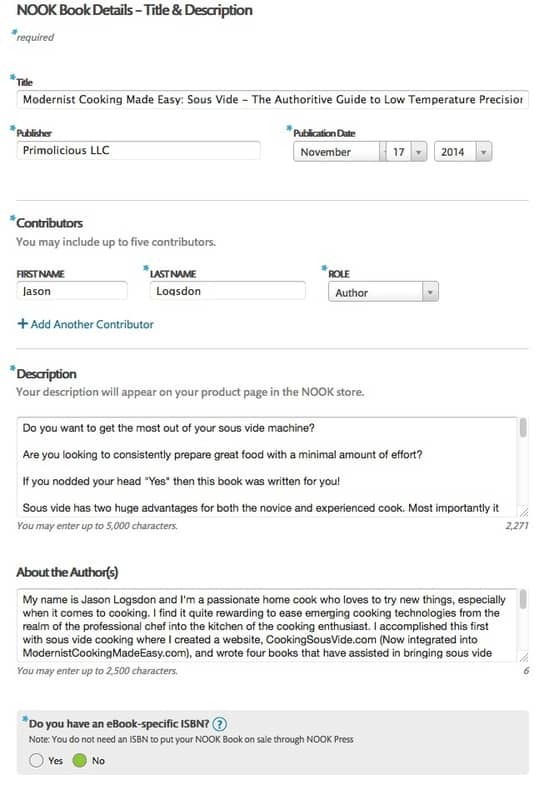 Jason Logsdon is a passionate home cook, entrepreneur, and web developer. He helps cooks understand sous vide and new modernist cooking techniques with easy-to-understand directions and recipes. He has several books and a website on sous vide and modernist cooking that are read by thousands of people every month including Beginning Sous Vide, Modernist Cooking Made Easy: Getting Started, Sous Vide: Help for the Busy Cook, Modernist Cooking Made Easy: The Whipping Siphon, Sous Vide Grilling, and Modernist Cooking Made Easy: Party Foods. He can be reached at jason@afmeasy.com or through Twitter at @jasonlogsdon_sv. Do you have an eBook-specific ISBN? If you enter in an ISBN number it must be different than one you have used for the print version. The ISBN number for the Nook format is completely optional and isn't really used by the Nook for much. We recommend saving your money and not using one for most Nook books. You can learn more about ISBN numbers. 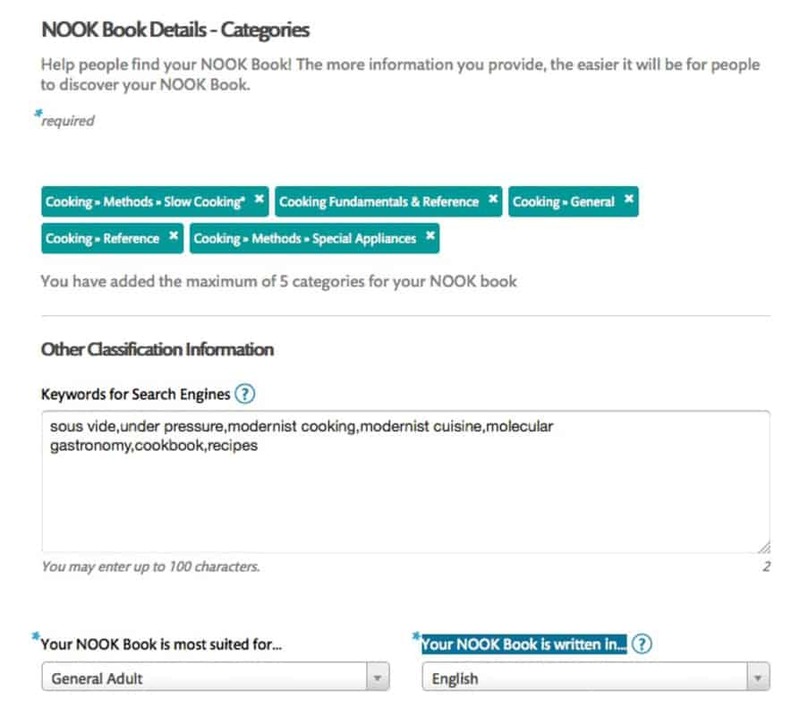 The categories determine where your cookbook will show up in the Nook hierarchy. You can add up to 5 categories. You can learn more about choosing categories. Enter in the keywords you came up with before. You can add up to 100 characters of keywords. To save some space leave off the space after the commas. I.E. "keyword1,keyword2,keyword three" instead of "keyword1, keyword2, keyword three". Choose the category that best suits your cookbook. Select the language your cookbook is written in. This section determines where your book is sold and how much it is sold for. 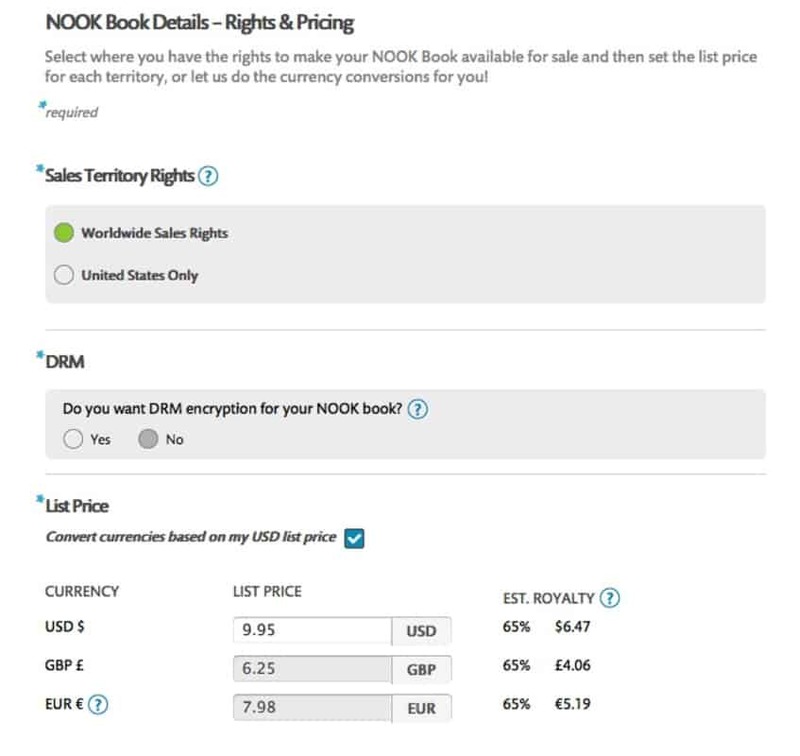 This option allows you to specify where you have rights to sell your Nook book. You can either choose worldwide or select individual territories. If you are self publishing then you will want to choose worldwide. Enabling DRM protection is a personal decision that we cover more in-depth in our article on what DRM means. Put in the list price of your cookbook that you determined earlier. You can choose to let Nook convert the other currencies automatically or enter in your own. This option is only for works that do not have a copyright and currently exist in the public domain. If you cookbook was written by you it is doubtful you want it in the public domain. Is this NOOK Book a part of a series? 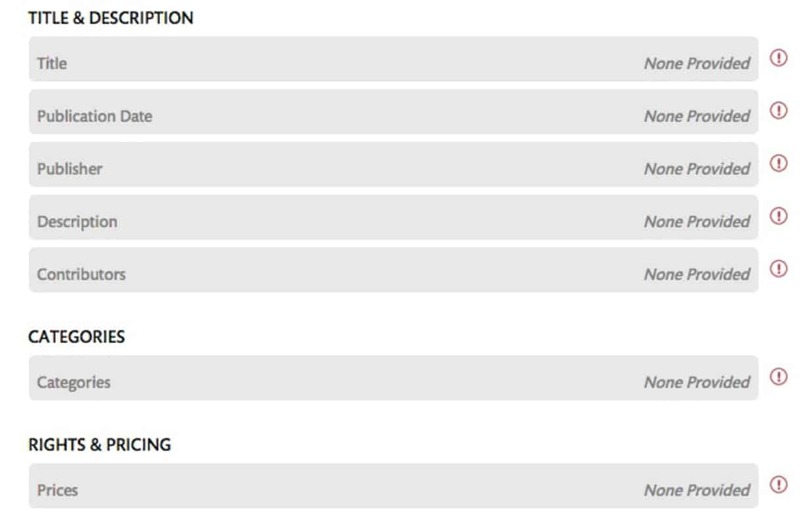 If your cookbook is part of a series then choose this option. 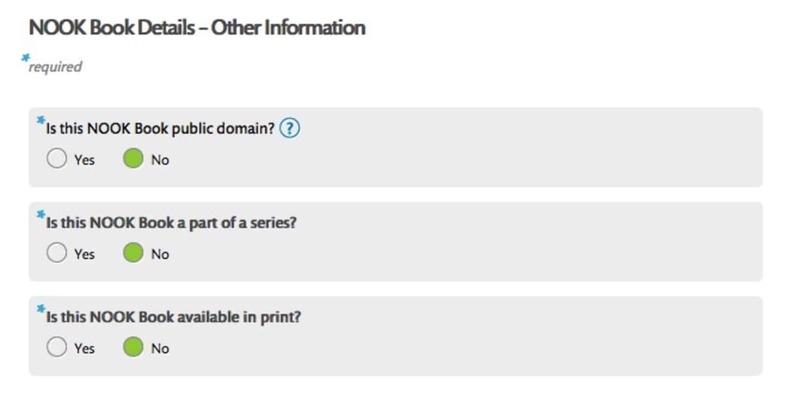 If you select it, it will also ask for the name of the series and the series number. Is this NOOK Book available in print? If you also have a print version of this book then select this option and enter in the number of pages it contains. 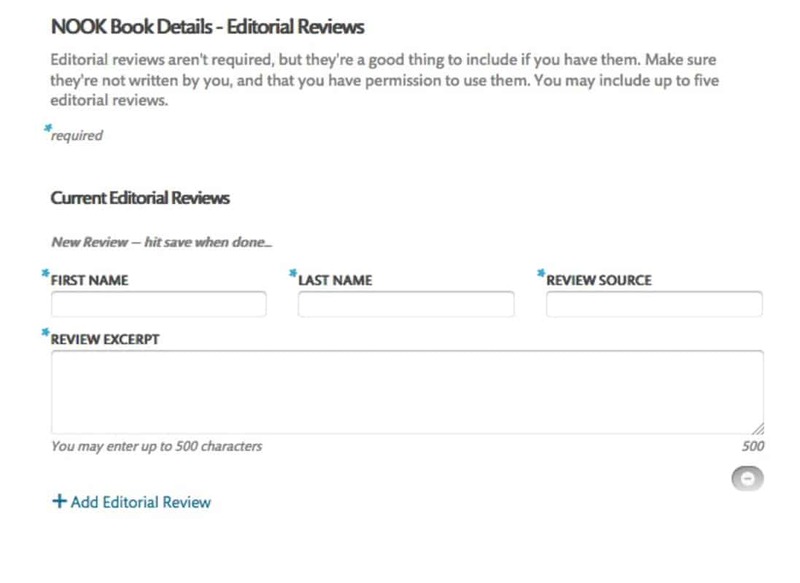 You can add editorial reviews that people have written about your book. These reviews show up on the Nook sales page.